These buttery logs with a crunchy almond coating are a traditional favorite in Finland. 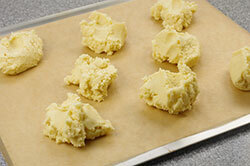 The cookies are thick, so if you are in doubt about their doneness, bake them slightly longer to avoid pasty centers. 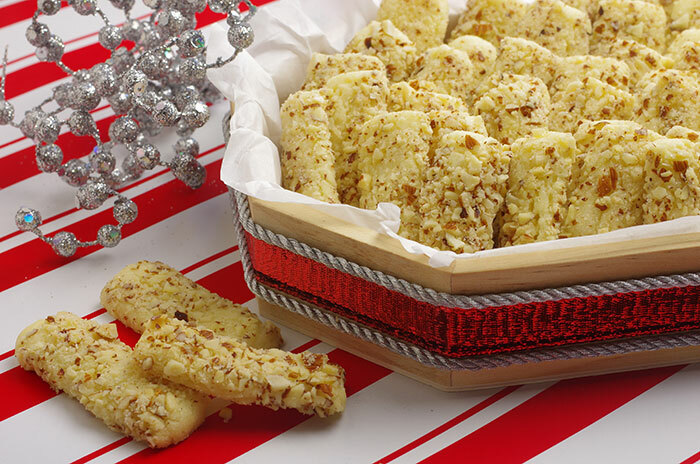 COOKIE EXCHANGE TIP: To play up the log theme, arrange these rich, nutty cookies on a platter decorated with miniature Christmas trees. 1. Preheat the oven to 350°F. Lightly grease or spray cookie sheets. 2. 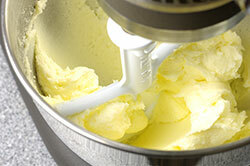 In a large bowl, with an electric mixer, beat together the butter and 1/2 cup of the sugar on medium speed until light about 2 minutes. Beat in the egg yolk, almond extract, and salt. On low speed, gradually beat in the flour just until mixed. The dough will by stiff but pliable. It should not be sticky. If it is sticky, refrigerate it for 15 to 30 minutes. 3. 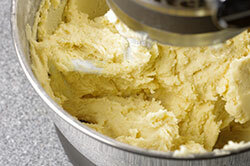 Divide the dough into 7 or 8 portions. 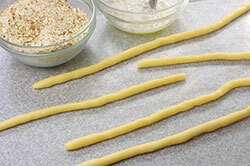 Roll each portion on a lightly floured board or sheet of waxed paper into a rope about 3/8 inch in diameter. 4. 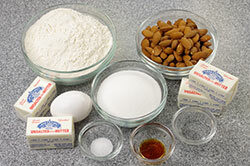 In a small bowl, stir together the almonds and the remaining 2 tablespoons sugar, then sprinkle evenly over a fresh sheet of waxed paper or a sheet of aluminum foil. 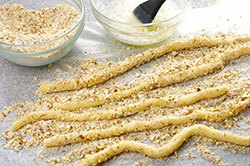 Brush each rope lightly with the beaten egg white, then carefully roll in the almond-sugar mixture to coat evenly. Cut the ropes crosswise into 2-inch pieces. 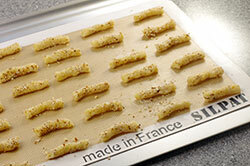 Place on the prepared cookie sheets, spacing them about 1-1/2 inches apart. 5. Bake in the center of the oven until set on top and just beginning to turn golden, 12 to 14 minutes. Let cool on the cookie sheets for 2 minutes, then transfer to wire racks to cool completely. Recipes from Very Merry Cookie Party by Barbara Grunes & Virginia Van Vynckt. Published by Chronicle Books, San Francisco, CA. Copyright 2010. Reprinted with permission of the publisher. All rights reserved.